The fifth Tamil Birders Meet was held at PAC Ramasamy Raja Polytechnic College, Rajapalayam, Virudhunagar District on 1st and 2nd December 2018. Around 310 individuals participated in this event. Panel discussion on ‘Women and birding’, Talks on bird migration, birds of Eastern Ghats, Rescue and rehabilitation of birds, planning for Pongal Bird Count 2019, talks on identifying larks, pipits, warblers, waders and raptors were organized during this meet. Several parallel sessions such as bird puppet making, sketching birds, analyzing eBird data, Wikipedia for birders were also conducted. Apart from this nearly 130 local school students participated and interacted with the top birders of the state. Participants also exhibited their bird images, sketches and stamps during this event. Detailed report of this event will be uploaded soon. See photos from this event here and here. The fourth Tamil Birders Meet was held at YMCA CAMP, Yelagiri, Vellore District on 21st and 22nd of October 2017. Around 100 people participated in the meet. Discussion on checklist of birds of Tamil Nadu, Threatened birds of Tamil Nadu, Filling eBird Gaps in Tamil Nadu, planning for Pongal Bird Cout 2018, talk on identifying various confusing bird taxa by experts were organized during this meet. Sessions such as sketching birds, making bird puppets, simple methods to understand our eBird data, introduction to eBird in Tamil, recovery plan for vultures of Tamil Nadu were also happened. See photos taken during the meet here. Detailed report here. 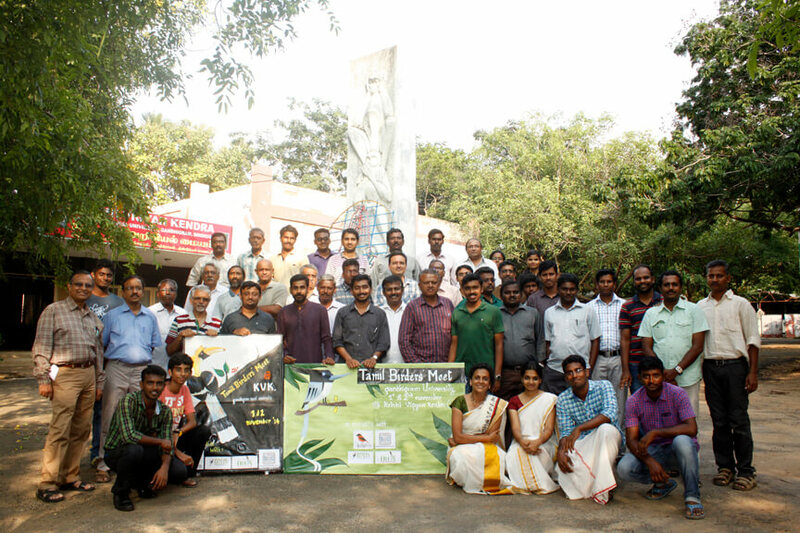 The third Tamil Birders Meet was held at PSN College of Engineering and Technology, Tirunelveli, on 12 and 13 November 2016. Nearly 200 individuals were registered and about 150 of them were participated in this event. Various talk happened during this meet including presentations on “Wetlands of Kanyakumari district” by Dr. Robert Grubh, “Birding in Tamil Nadu” by S. Theodore Baskaran and “Status of Vultures in Tamil Nadu” by Bharathidasan. Apart from this sessions on bird identifications, sketching birds, bird games for school students, reciting poems on birds in Tamil, poster presentation, planning for Pongal Bird Count 2017 were also conducted. More details on the meet can be seen in this report. 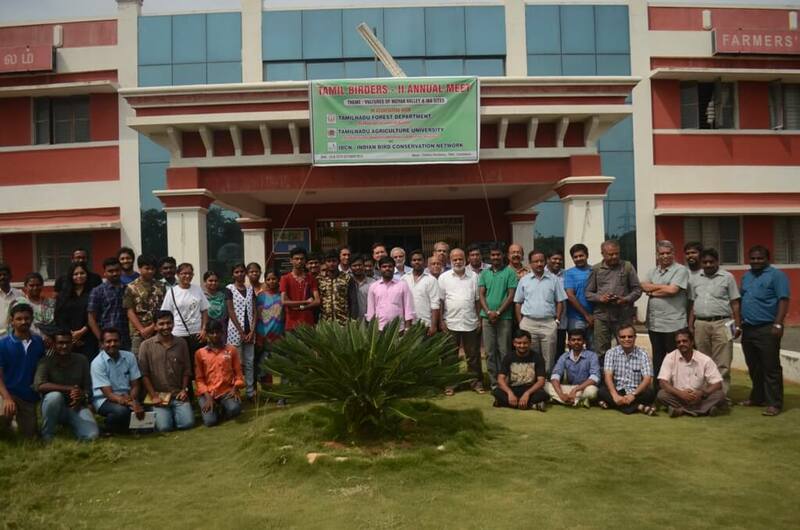 The second Tamil Birders Meet was held at the Tamil Nadu Agricultural University, Coimbatore on 24th and 25th of November 2015. 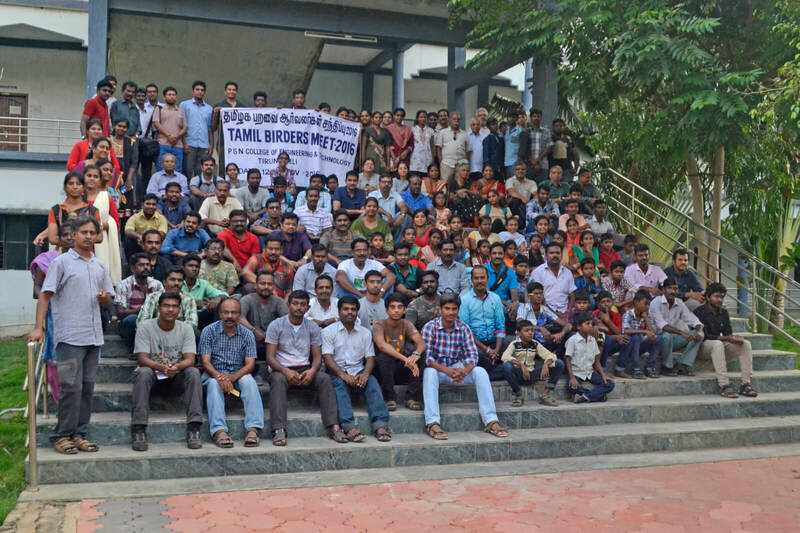 Around 80 people participated in the meet. The meeting was inaugurated by Mr. Anwarudeen, Conservator of forest, Coimbatore circle. The much awaited “Annotated Checklist of the Birds of Tamil Nadu and Puducherry” was released by Dr. Santharam. Till now 515 species of birds have been recorded from Tamil Nadu. The document has been posted in Tamil birds Yahoo group for comments and suggestions. Seven talks and two posters were presented during the two days meet covering various subjects such as Raptors and Vulture surveys, Important Bird Areas of Tamil Nadu, Advocacy for bird conservation, Introduction to eBird, status of eBird in Tamil Nadu, birds in agricultural ecosystems and bird survey in Eastern Ghats. Well known author Mr. Ratnam, who has authored books on birds of Tamil Nadu in Tamil was felicitated during this meet. Suggestions on outcomes of the present meet and planning for the next meet were discussed. The meet concluded with a discussion on planning for the 2016 Pongal bird count and initiating of heronry count in Tamil Nadu. More details on this meet with photographs can be seen in this PDF document. About 50+ participants from all over the state attended the two days meet where discussions on Bird Monitoring, Conservation and Bird surveys across the state were discussed in detail. The various presentations happened during the meet include Document & Bird Monitoring using eBird, IBAs and their monitoring, Melagiri Survey highlights, Pelagic Birding & highlights, Bird Counting techniques, a demo on uploading data in eBird and Steps on Vulture Conservation. 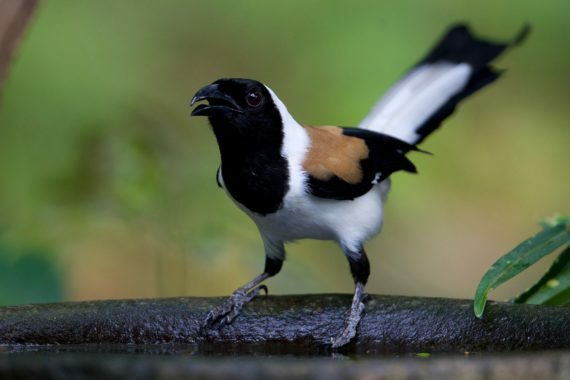 The core team will come up with a South India checklist of bird species, which will then be circulated through the Tamilbirds yahoo group. Volunteers of each district will come up with their checklist from the main checklist and can do additions with valid comments. An expert panel will be formed to review each district list. Checklist will be prepared based on the available published literature as well as sight records posted in various forums such as Tamilbirds Yahoo Group and eBird. New IBAs were proposed by birding groups from Chennai & Coimbatore and the proposal documents are submitted. The first Pongal Bird Count (PBC) will be conducted on 15-18th Jan 2015 for recording & monitoring of different bird species in Tamil Nadu. PBC will be an annual bird monitoring program for our state when people will observe birds for a minimum of 15 minutes and upload the sightings into bird listing & documentation platform “eBird”. The final data will provide valuable information on the distribution & abundance of the birds of Tamil Nadu. Experienced/Skilled bird watchers are requested to encourage beginners into bird-watching and also conduct brief sessions on introduction to PBC & eBird for their districts. A blog post in Tamil on this event with photographs is available here.